The attacking player was on the ground facing down with his left hand on his back. I looked at the defender with my eyebrows raised. He was standing relatively close to me as I customarily approach players when I want a private discussion. He had just done something egregious. I remembered back to what an instructor had told us at the last referee camp. When does a referee need to resort to a red card? Yes there are seven prescriptive reasons but what do they fundamentally mean? When a player has taken an action so unfair that it threatens the stabilization of the entire match. Was there any chance of redemption? He had made the decision for me. I reached for my back-pocket. His eyes tracked my right hand as I reached. I fumbled the first grab for a brief second. I saw a brief glint of disappointment and partial dismay in his eyes. I pulled it out and held it up perpendicularly as I always do. 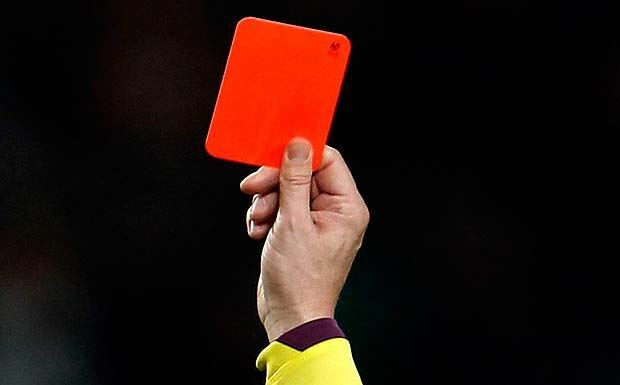 Showing a red card is one of the most confrontational actions you can take in the game. I’ve never intentionally looked at a player in the eyes or presented aggressive body language while doing it. Don’t get me wrong. Be firm, be decisive in the movement but don’t make eye contact. That’s my policy. The red card sends the rest of the message. In my eyes, once I’ve made up my mind, the player has evaporated from the field. I don’t make eye contact with them anymore. I look away and don’t engage other than ensuring they leave the field of play and the surrounds. It’s so simple. Never look an angry bull directly in the eyes. You challenge them by doing so and once they are being removed from the game, there is a feeling of nothing to be lost. There was the expected roar of anger, anguish and surprise from the touchlines. Was it surprising? Not at all but it was their star player. He was presumably unhappy about a challenge on him just earlier. He was chasing his opponent with the ball (albeit not evident in his intention) and trailing by a step. He retaliated by elbowing his opponent in the back in a rather meek manner. Not easy when moving at pace and from the distance between them but it was a massive threat to the game. I prefer not showing a red card when the heat level is high and try to bring the temperature down first. Sometimes, both those things need to happen at the same time. I’m often more wary of driving the temperature up even higher and the shenanigans that ensue after a red card while the pressure point is so high. My typical approach is ensuring the victim is taken care of and that the offender isolated if I get there quick enough. Once that’s done, I can calmly issue the send-off. This catches most people off guard because they expect the red card to happen quickly or not at all. I glanced down at my watch. It was the 89th minute of play. My AR looked at me and responded. There was no mistaking the stone-cold look in his eyes. This decision was huge. I knew the fall-out that would come from it only a matter of seconds later. It was the third time I had asked him in succession and he was more confident with each response. I turned around having mentally accepted his decision. I trusted him even though I was skeptical at what had transpired. The players were all strewn across the field waiting to see what I had run over for and the decision. They didn’t have an inkling of what was coming. I put the whistle to my mouth and blew hard pointing to the penalty spot. The sale and execution of the decision had to be nothing less than 100% to pull this rabbit out of the hat. Penalties don’t mysteriously appear at the eve of the 90th minute of a 2-1 match for the losing team. From my angle, I had seen two players in the penalty area jump up and they were both facing me. The attacker in front was falling over from the challenge but the defender was able to play the ball. My AR had told me that the ball was deliberately handled on the challenge. The offending player meekly protested but his teammates most certainly took issue. Could I blame them? Not at all. I would have been shocked in any capacity on that pitch to have seen that same decision. This is where I now reflect on the decision and advice I had been given before. Don’t be the only person on the pitch that saw the incident. The spirit of the Law is in line with conducting the game with what football expects. Was this expected? No. After a surprisingly small amount of man management, we set up for the penalty kick. They converted to equalise the score. The remaining three minutes of injury time was a frantic finale with high pressure. I had to increase my work rate to ensure nothing went wrong since each decision was more critical than the last. The tempo of the game was very high. Fate would have it that the team that was leading before received a free kick well outside the penalty area in the final minute. A high drama goal-mouth frenzy ensued from the cross and the ball was put in the back of the net. The elation was so high at the winning goal, given the events of the game and timing that the bench stormed the field. I looked at my watch. Time had just expired. I blew the whistle to end the game. There was no point in restarting. That goal had vindicated a lot of post-game questions about the penalty kick decision and it was a solid 10-15 minutes before the celebrations had wound down but everyone knew it was a special night and an entertaining ending. No shortage of drama on the Sunday and Saturday respectively. A solid weekend all-in-all. This entry was posted in Football Game Recap and tagged assistant referee, deliberate handling, elbow, free kick, injury time, penalty kick, red card.